This is an exciting week for the Project Black Star Investigation, as the seismic/volcanic reveals a startling pattern that deserves our undivided attention. Before we begin, please allow me to apologize for a late Black Star Update Report, as the primary newsletter contributor had a death in the family and was only able a few minutes ago to send me the information needed to complete this report. Please keep New (his screen name) and his family in your prayers. Those of you paying attention to my recent Reports know that we are supposed to have a ‘Jolt’ this week in the 2.5 to 4-magnitude quake events. Let me provide a little background commentary for those new to the Investigation: Below you will find a very long and growing chart that combines the seismic values for the 2014 Earth Orbit Cycle and the current 2015 Earth Orbit Cycle that begin on different days in January. The new Earth Orbit Cycle relative to the inbound Black Star begins, when Earth makes that magical 90-degree angle coming to what I refer to as “outside-orbit position” marking the week that our planet has the ‘lowest’ number of 2.5 to 4-magnitude earthquake events. That date last year was the week of January 5, 2014, while this year the new Earth Orbit Cycle began around January 20, 2015. Look at the top of the 2014/2015 Abbreviated Seismic Chart and find the yellow line with the “O” marking ‘outside orbit position’ that was predicted months in advance. The following week is marked by the “J” indicating a “Jolt” Value, as this is by far the largest value for these key indicator earthquakes taking place each year in the ‘second week’ of each Orbit Cycle. If you go down to the fifth week of the 2014 Orbit Cycle, then you see another “J” for the 6-magnitude earthquakes with a ‘5’ value that appears to pop up from nowhere. However, go down to the fifth week of 2015 and you will see the same Jolt. Today we have the seismic data to accurately identify another Jolt Value for the key 2.5 to 4-magnitude earthquake events that I alluded to last week, because we approached the predicted 180 value anticipated for the week of August 15, 2015 too early in the Orbit Cycle. First, go down and look at the 2014 values for Week 25 and you will see what I mean. Last year we saw a jump in these earthquake events from 205 to 244 to a whopping 324 quake events for Week 25. Now look at the values for Week 25 for the 2015 Orbit Cycle. That’s right! This week we see a big jump from just 199 quake events to 328 of the 2.5 to 4-magnitude earthquake events on the same Week 25 of the Earth Orbit Cycle that we saw last year and the jolt value is higher by just 4 quake events. Now look back at the 2014 values again to realize we also had a 7-magnitude earthquake following a number of “0” goose eggs. Remember again that this seeming increase in seismic activity is taking place within the first earth change ‘lull period’ for the 2015 Earth Orbit Cycle and we continue to expect seeing 180 of the 2.5 to 4-magnitude earthquake events for the week of August 15, 2015; when the next earth change uptick period begins. My concern right now is for the people living along the Pacific Ocean/Ring of Fire and particularly those living along the coast between the Alaska Quake Swarm Area and the California Quake Swarm Area. As reported in my warning videos, my investigation sees a pattern of deep earthquake and volcanic activity with pressures shifting after the 7.8 Nepal Quake (April 25, 2015) that took place at our “N” nearside alignment in the chart to continue shifting East with the 7.8 Japan Quake (May 30, 2015) that shook the region from a record depth of 677 kilometers. Open up your Equake3D to realize we have what appears to be two massive waves of deep earthquake/volcanic activity circling the Pacific Ocean/Ring of Fire from the North and South that is expected to converge somewhere near the California Quake Swarm Area, which I believe is what all the warnings from USGS and others is all about; as they see the same pressures building on the American side of the Pacific Ocean/Ring of Fire equation. This activity today is moving in slow motion, because we are still firmly inside the earth change lull period; but all of that is expected to change after August 15, 2015 running through the coming earth change uptick period that runs all the way to December 1, 2015. The geopolitics with the Jade Helm 15 exercises, 500 Day Climate Chaos (story) prediction, Jewish prophecies, etc., point to something BIG happening around the Fall Equinox on September 23, 2015. Those of you living along the US West Coast and actually anyone living west of the Rocky Mountain Ridge are in the danger zone expected to be the eye of the coming storm that changes America forever (Future Map). 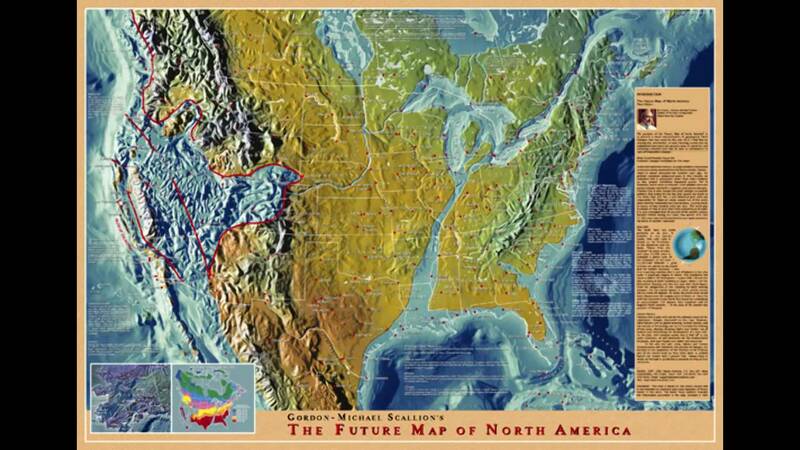 Click on the link and open up the Scallion Map of the Future to realize this is what the USA can easily look like following the kind of seismic/volcanic ‘event’ and the events that follow in combination with a Black Star-induced geological pole shift what would erode the coastlines of all the nations on Earth from the oceans sloshing around. Earth saw seven new volcanic eruption events this week with more of these events taking place in the USA, as these pressures I have been warning about continue moving in our direction. Again, the only reason these big events are holding off is because Earth has yet to reach outside-orbit position, as the current lull period continues.